You are here: Home › Stayfitcentral Health & Fitness Blog › Health & Fitness Blog › Ask The Experts › Do You Really Need To Cycle Creatine? Does creatine cycling – going an off for a month or more at a time – work or is it just another supplement industry myth? Keep reading to learn the truth. The first time I took creatine monohydrate it worked. Big time. I gained 7 pounds in the first 5 days and my strength and workout endurance seemed to go through the roof. I was able to quickly add 20 plus pounds to my squat and perform more reps at every set. Unfortunately, I was under the impression that it was necessary to take a break or ‘cycle’ creatine. No really good explanation was given as to why either. The ‘experts’ in the magazines just said this would help me get better results. Personal experience and what I’ve learned from reading dozens of research studies has taught me what fitness magazines never did. In this article I will share what I’ve learned with you so you too will no whether creatine cycling really works. Why Do Some People Recommend Cycling? People may have also recommended going on and off creatine for weeks at a time to make it seem more like using steroids as this is the way people often use them to eliminate negative side effects. Whatever the reason, I quickly learned for myself that cycling creatine supplements wasn’t a good idea. While I maintained some of the muscle and strength I gained, they did both decrease pretty significantly. My workout endurance also went back to my pre-creatine levels after about a month. Going back on creatine only took me back to where I was after taking it the first time so no extra gains were made. What I should have done and you will probably find this to be true too is kept taking 5 grams of creatine every day. This would have kept it in my muscles and enabled me to continue gaining muscle, strength, and getting fitter. Sure, the results may not have continuously been like when I first used it but at least I wouldn’t have had to start over pretty much from scratch. As long as you are healthy, taking creatine monohydrate every day for long periods of time appears to be safe. There are now several studies which show that taking it for months and even years does not cause any problems in health men and women. This includes a group of athletes who took it for several years without harming their kidneys. Instead of worrying about cycling your creatine supplements, it’s probably a better idea to make sure you use it properly. Below are some tips based on the latest research to help you do so. Only use creatine monohydrate. This is the only type of creatine supplement that is shown in dozens of peer-reviewed studies and with millions of users to work. Always do a loading phase first. Studies show taking about 25 grams a day for 5-7 days produces the most benefits. Maintain with 5 grams a day. Taking just 5 grams daily after loading will keep your muscles filled and the benefits coming. Don’t worry if you miss a day here and there. It takes being off for about a month for it to completely leave your muscles. Work out hard. The harder you train, the better your results will be. Focus on exercises like kettlebell swings, squats, deadlifts, and rows and you’ll build muscle and strength faster than ever before. Don’t take more than 5-10 grams at a time. Smaller doses divided over the course of the day decreases the odds of you getting an upset stomach. If you want to learn more about getting the best possible results from creatine monohydrate, read this article. Now you know all there is to know about the creatine cycling myth that’s perpetuated the sports supplement world for 20 years. Simply loading for a week and then keeping your muscles filled with a scoop a day thereafter is what will give you the best results over the long haul. 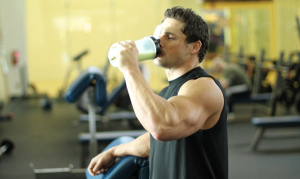 When choosing a creatine supplement it’s best to keep it simple too. I recommend Betancourt Micronized Creatine Monohydrate. It’s 100% pure creatine monohydrate that’s milled into a really fine powder. It dissolves better in water than regular creatine powder so it’s easier to mix and drink. At pennies per serving you can’t beat the cost either. You can buy Betancourt Micronized Creatine from our store. Greenwood M1, Kreider RB, Melton C, Rasmussen C, Lancaster S, Cantler E, Milnor P, Almada A. Creatine supplementation during college football training does not increase the incidence of cramping or injury. Mol Cell Biochem. 2003 Feb;244(1-2):83-8. Gualano B1, Ugrinowitsch C, Novaes RB, Artioli GG, Shimizu MH, Seguro AC, Harris RC, Lancha AH Jr. Effects of creatine supplementation on renal function: a randomized, double-blind, placebo-controlled clinical trial. Eur J Appl Physiol. 2008 May;103(1):33-40. doi: 10.1007/s00421-007-0669-3. Epub 2008 Jan 11. Mayhew DL1, Mayhew JL, Ware JS. Effects of long-term creatine supplementation on liver and kidney functions in American college football players. Int J Sport Nutr Exerc Metab. 2002 Dec;12(4):453-60. Pline KA1, Smith CL. The effect of creatine intake on renal function. Ann Pharmacother. 2005 Jun;39(6):1093-6. Epub 2005 May 10. Poortmans JR1, Francaux M. Adverse effects of creatine supplementation: fact or fiction? Sports Med. 2000 Sep;30(3):155-70.